This post is the first in a nine-part series about the historical antecedents of ACUS. President Roosevelt had convened the Committee a year earlier, in 1936, to study the organization (and reorganization) of the executive branch. He selected Louis Brownlow, a political scientist and former Commissioner of the District of Columbia, to lead it. 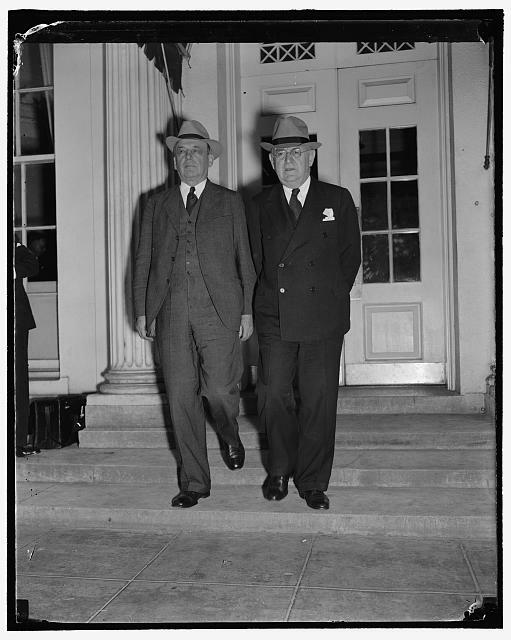 Charles Merriam (l) and Louis Brownlow (r) leaving the White House after discussing government reorganization with President Roosevelt (Library of Congress/Harris & Ewing Collection). Its researchers undertook a wide-ranging series of studies related to the government’s personnel policies, fiscal management, and independent regulatory commissions. It considered the organization of the Departments and the nature and procedures of agency rulemaking. The Committee was the first of its kind since the Taft Administration’s Commission on Economy and Efficiency and the Committee on Department Methods under Teddy Roosevelt. Through World War I, the Roaring Twenties, and the early years of the Depression, the federal government had clearly changed and grown. And while the Brownlow Report led to the creation of the Executive Office of the President—and little else—its legacy, the concept of a government body to study and improve administrative procedure, proved enduring. Next week: Part 2, The Committee on Administrative Procedure Proposes an Office of Federal Administrative Procedure.